The former house of Marta and Lion Feuchtwanger is an artists residence today. 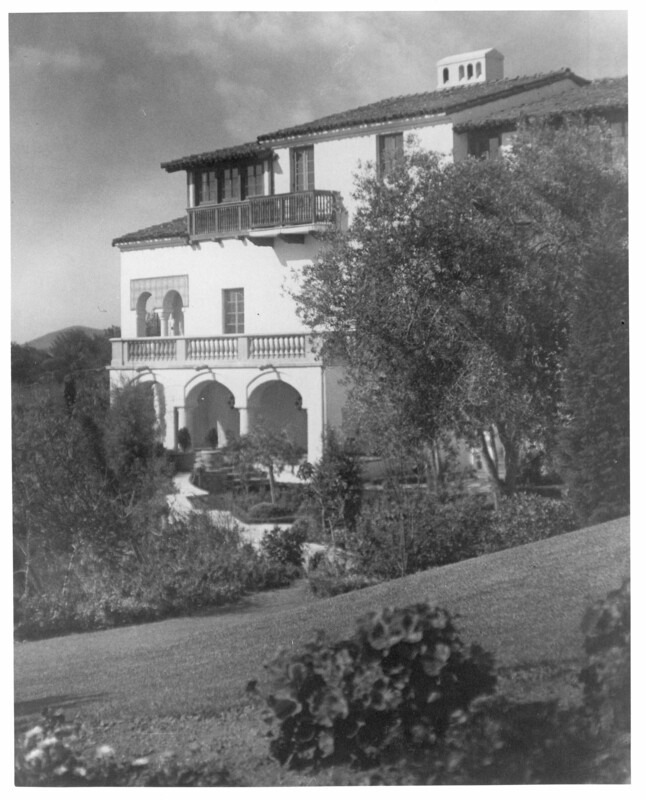 This photograph shows the Feuchtwanger's former residence, Villa Aurora, on 520 Paseo Miramar, Pacific Palisades, California, with a view from the southwest. 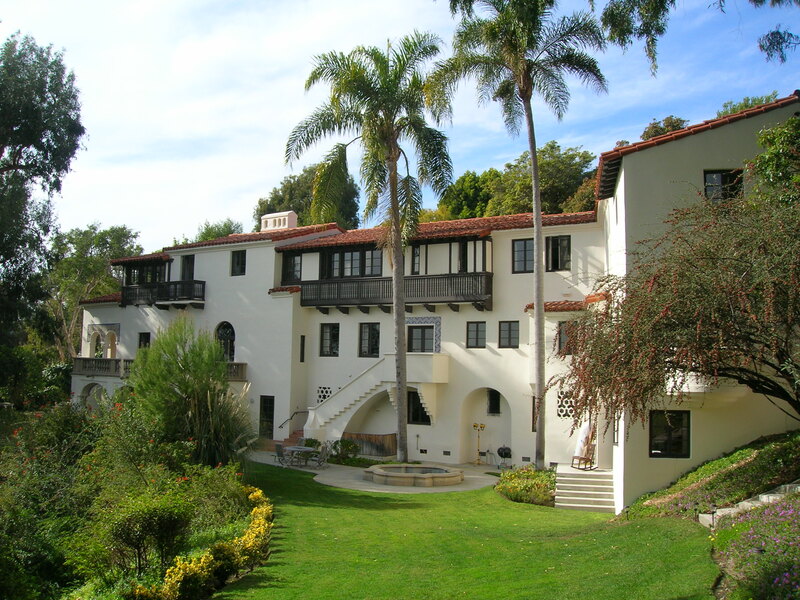 Villa Aurora was built in the late 1920s as a joint project between Miramar Estates developers Arthur Weber and George Ley and the Los Angeles Times. The Villa, then known as the "Los Angeles Times Demonstration Home," served two purposes. Primarily, it was to be a model of the "latest developments in domestic technology and home planning ideas." In addition, the Demonstration Home would show skeptical Angelenos the benefits of living far from the city center. The progress of the Demonstration Home was chronicled with weekly articles in the Times. The newspaper urged interested readers to view the house for themselves to see firsthand current techniques in home building. According to the Times, thousands of people toured the Villa during its construction and in the month following its completion. The design of the Demonstration Home was based on a castle in Sevilla, Spain. The carved and painted wooden doors and ceilings were designed with Moorish motifs by Thorwald Probst, inspired by the Cathedral of Teruel in Spain. The Demonstration Home was a showcase for the latest technological inventions-the kitchen boasted a gas range, electric refrigerator and dishwasher, and the spacious three car garage was opened by an electric garage door. The Feuchtwangers were able to purchase Villa Aurora in November 1943 for the extraordinarily low price of $9000 due to circumstances of the war. With gasoline rationing in effect, travel between Pacific Palisades and Los Angeles was difficult, making purchase of outlying real estate unappealing for most. As Lion Feuchtwanger sought solitude for his writing and loved the Mediterranean setting of the Villa and its views of the Santa Monica Bay, the decision to purchase Villa Aurora came easily. Lion Feuchtwanger lived in Villa Aurora from 1943 until his death in 1958. During these fifteen years, he wrote six novels in his study on the top floor. The spacious Villa also saw the birth of Lion Feuchtwanger's third and final library, which rapidly grew in size to nearly 30,000 volumes before his death. Villa Aurora became a meeting place for the German émigrés and artists in Los Angeles. The Feuchtwangers often hosted a light evening meal that was followed by a reading from Feuchtwanger's current novel. Among those invited over the years to these readings were Vicki Baum, Bertolt Brecht, Bruno Frank, Gina Kaus, Heinrich and Thomas Mann, Ludwig Marcuse, and Franz Werfel. The Feuchtwangers also enjoyed inviting a few couples to afternoon tea. Frequent visitors to these intimate gatherings were Charles and Oona Chaplin, William and Charlotte Dieterle, Hanns and Lou Eisler, Peter Lorre, and Arnold and Gertrude Schoenberg. Following the death of her husband in 1958, Marta Feuchtwanger bequeathed Villa Aurora and Feuchtwanger's library to the University of Southern California. The Feuchtwanger Estate passed to USC in late 1987 upon the death of Marta Feuchtwanger. In 1989 Villa Aurora was sold to the Friends of Villa Aurora Inc., a German consortium interested in preserving this historic monument. Now fully restored to its original splendor, the Villa is home of the Villa Aurora Foundation for European American Relations. A large portion of Feuchtwanger's library remains on permanent loan at Villa Aurora from the University of Southern California.